LETCHER, S.D. - A 9-year-old boy with autism who went missing in rural Davison County was found safe after a nightlong search. Eastin Dorr was last seen about 5 p.m. Wednesday. 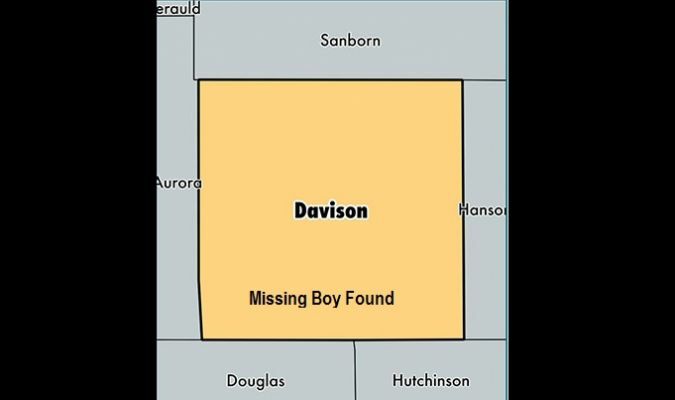 Sheriff's Deputy Josh Peterson found the boy walking along the side of a road about 9 a.m. Thursday. Peterson tells The Daily Republic that Dorr had spent the night "in the weeds and the bushes" but basically was in good health. A medical team examined the boy and found him to be uninjured. The Sanborn and Jerauld County sheriff's offices, Davison County Search and Rescue and the Mitchell Department of Public Safety also were involved in the ground and aerial search.